Almost identical to the Yashicaflex B (new model) and Yashica D in other respects, it has the unique ability amongst Yashica TLRs to shoot 35mm when the supplied kit is installed in the camera. 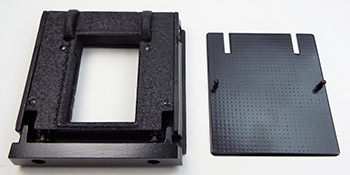 Loading and winding 120 film is identical to other knob wind auto-stop models. With the 35 mm kit fitted, all film winding and rewinding is taken care of by the controls on the spool knob side. The Yashica 635 is not the only 35 mm equipped 6 x 6 TLR. 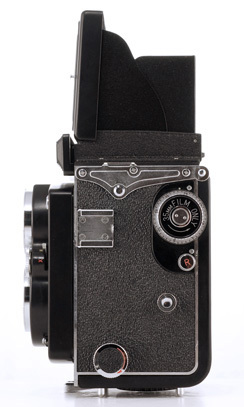 The Rolleis had the Rolleikin adaptor kit which first appeared in 1933. 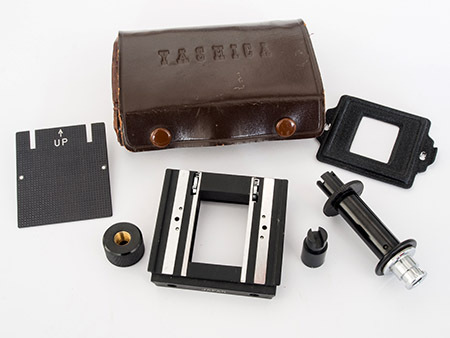 The original kit required a new back in addition to the film guide and spool adapters. There was also the Rolleikin 1 which I know little about and may have been similar to the Rolleikin 2 but included a special back for later models without a dual format pressure plate. The Rolleikin 2 didn't include a special back but did require some dismantling and replacement of the spool knobs. It seems to fit all post 1949 Rollei TLRs except the 44 and Magic models. The Rolleikin C (I have seen it referred to as both the “C” and “2C”) is basically the same kit without the replacement 35 mm film winder/counter for those early 2.8 models, starting with the 2.8C in 1953, with the winder/counter already installed, much like on the Yashica 635. 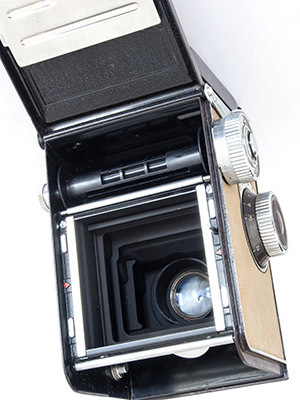 The mid-1950s Meopta Flexaret IVa introduced built-in 35 mm capability which continued with future models (except the return to basics “Standard” of 1965) but a rewind button didn't come until the Va. 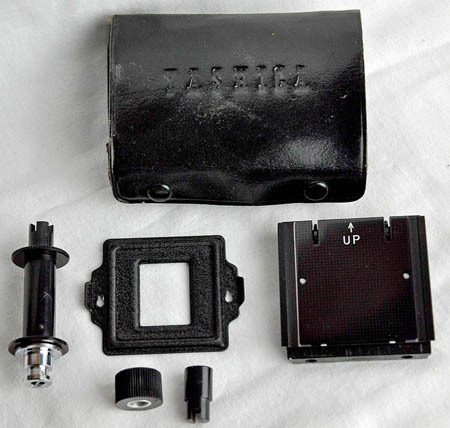 Similar kits to the Rolleis and Yashica 635 were still required (there were several variations) but an additional film counter counting in tens was built-in as was a 35 mm sports finder flap in the centre of the larger 6 x 6 cm one. The budget geared lens Super Ricohflex TLR released in 1956 had an optional 35 mm film insert which filled most of the camera's empty insides. This was called the “Ricohflex Color-Back” - a clue to answer my question which follows shortly. 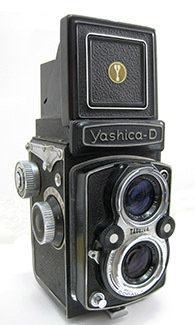 The much more sophisticated 1959 crank-wind Ricohmatic 225, a development of the Diacord series, was supplied “With Color-Back 225” on the box - a typical 35 mm kit similar to the Yashica 635 one. 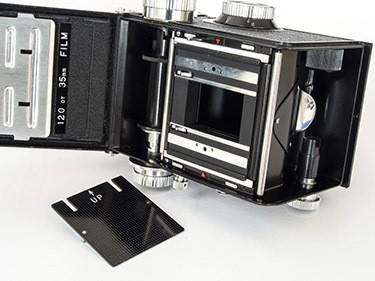 Why would anyone want to shoot 35 mm in a medium format camera? These days, we tend to think of a separate tool for every little nuance but in the less affluent times of the 1950s and 60s, perhaps people were more prepared to compromise to have the convenience of both formats, particularly if 35 mm was only an infrequent need. Initially, colour film was not available in the larger size and I have seen it suggested that Kodachrome slide film was also a factor - this was not available in 120 size until the mid to late 1980s. These days, the main reason for shooting 35 mm in a 635 is to have fun. Often, people mention the advantage of using 35 mm for portraits. It is true that by its design and portrait orientation for 35 mm, ergonomically the TLR is a great tool for shooting portraits and the 80 mm normal length 6x6 lens becomes a mid-length (but still shortish) 35 mm portrait lens, however, image quality remains a compromise. Yes, only the best central part of the image circle is being used for 35 mm but in general, 35 mm lenses are more highly corrected and offer a higher resolution to partially offset the advantage of the larger 120 format. 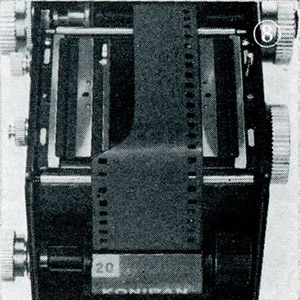 The lower scan shows the film guide/ sprocket assembly installed in the camera without the pressure plate (note that the rewind release button, “R”, must be locked out for installation and then released when assembly is complete). The pressure plate lifts off to load film and is located by the two pins attached to either side. The last type features a similar black case but with “Yashica” in the modern sans serif font. A little while ago, a correspondent contacted me with some questions about his 635. It was a very nice example from April 1967 (SX 704etc) but normally, all 635s have a modified spool support on the bottom right when holding the camera. On other models, there is the support shaft and then a collar which acts as a spacer. The collar on the 635 is male threaded to accept “(9) Metal Adapter Ring” shown in the diagram above and discussed in the previous paragraph. The thread has no effect on 120 spools whatsoever. His camera didn't have the thread. The obvious answer is that someone has modified it with a part from a different model but that is in fact fairly unlikely. It is a non-moving part that doesn't show any wear even when extreme wear and mis-treatment is evident elsewhere. To replace it would require the leatherette covering to be removed - there are no obvious signs of that. It seems far more likely that this is a factory mistake. I can confirm that my slightly later SX 7091463 is threaded. Correspondent's camera on the left. According to Karl Kahlau's Yashica/Kyocera documentation, the Yashica 635 was released a few months earlier than the Yashica D. He doesn't have an end date but according to the website “A Partial History of Yashica TLRs”, using similar source material, it lasted until 1972 or 1973 but by serial numbers, I have only found evidence of production up to 1971 so far. As expected, the trim changes somewhat mirror the Yashica-Mat and Yashica D. The main exceptions are that there was no coloured leatherette or related gold narrow “Y” hood logo as on the Yashica D, the accessory shoe always had 4 screws as opposed to 0 or 4 on the Yashica D and it seems that the black radial control wheels were implemented and then immediately discarded. This is the first example in my database with the block letter style “Yashica” between the lenses instead of the previous oval style and the only example with the radial wheels. All later ones have the first type with black leatherette inserts until all models in production moved to the dull silver type. Camera owner Glen of the “Focus on Newfoundland” photography site wrote that the original owner claims that there have been no alterations to the camera. Glen has also heard murmurings from collectors that claim that only a handful of these left the factory. 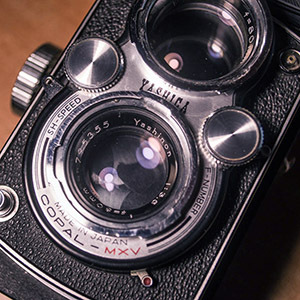 It is the case that when both the Yashica D and Yashica-Mat changed to the block letter style “Yashica” between the lenses, they changed to the radial style wheels at the same time. At that point, both the Yashica D and Yashica-Mat also had seven digit serial numbers commencing with “39” as does this camera. So in terms of the other comparable models, this camera is entirely consistent. The question of course is, why did Yashica revert to the older style control wheels? The earlier wheels were a Rollei copy - was it to emphasise the difference of this more serious camera with the consumer focused Yashica D in its variety of colours at the time? I have also come to realise that Japanese market Yashica Ds never changed to the black radial type, they also kept the leatherette inserts until the advent of the dull silver type (see Yashica D section below). 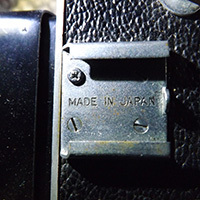 “Made in Japan” appears in the accessory shoe of the first cameras up to serial number 5860xxx (still in the first month or two of production). It is on all eleven of the first sixteen cameras in my database where the shoe is visible. Later cameras don't have it. As far as I am aware, it is only found on 66 models on the early Yashica 635 and early coloured Yashica A where it very quickly changed to simply “Japan”. 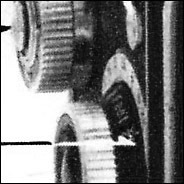 On late cameras, starting in March-April 1968, the slotted accessory shoe screws were replaced with cross head types (almost certainly Japanese JIS standard rather than Phillips - tight screws can be damaged by a Phillips driver). Note, the strap holder screws also changed but not until about August 1970. 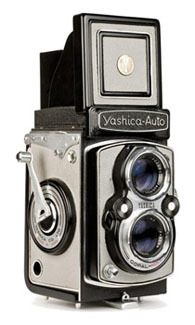 Like with the Yashica D, Mat and other models from the period, “Made in Japan” on the locking knob/tripod mount didn't reappear until 1960 (it had been there on earlier models). I have not yet found any with internal light baffles and don't expect to because of the lack of a version with focusing scale in meters. 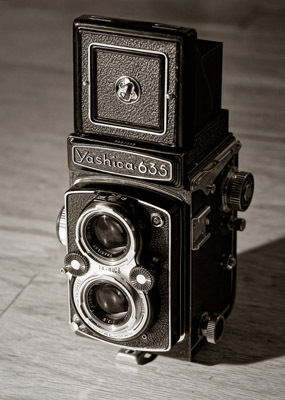 Like the Yashica D, the Yashica 635 was a significant export model for Yashica but what of Japan? 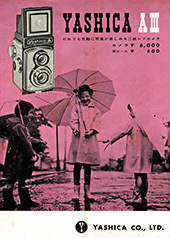 The Yashica 635 was advertised with its own dedicated 160 page Yashicaflex Photography book in Japanese. Below is part of a Japanese brochure from about 1958 (other pages from the brochure cover the new Yashicaflex A and B and Yashica-Mat). I have seen it in other Japanese brochures and ads as well but without ever finding an example on the net with a metre focusing scale. Detail from this brochure clearly indicates a focusing scale in feet. Japanese market cameras don't usually have the ® mark on the nameplate. The first example in my database with the mark is the fourteenth camera, the first with a seven digit number, 5850xxx. I have not found any other 635s without the mark in the period that it was in use. Few turn up on Japanese auction sites which may simply mean that Yashica did not plan to sell enough in Japan to warrant a separate version. Although the camera was advertised in 1958 Japanese brochures, it and the Yashica-Mat had disappeared from the 1959 brochures. On the other hand, how hard is it to make a batch with knobs from a different box (the same style focus knobs were used for all contemporary knob wind models)? A mystery. The camera in the earliest user manual is 56602 with taking lens 981xxx and viewing lens 98220x. The two earliest cameras in the wild have body serial numbers 58xxx, the first with taking lens 992xxx and viewing lens 980xxx and the second with taking lens 982xxx and viewing lens 983xxx. Lens numbers rise to 992xxx taking lens and 995xxx viewing lens before camera 60xxx introduces a new lens series with 204xxx taking lens and 201xxx viewing lens. The next camera, 61xxx, lenses 210xxx and 207xxx is the last with a five digit serial number. There are thirteen of these earlier serial number cameras in my database. That in itself is odd, by this stage, all models, except the early Yashica 44, were using a serial number with date code (at least certainly not just a simple sequential number). 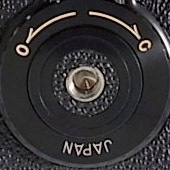 They are the only examples with the 9 flag film speed reminder on the film winding knob. All others have the later combined silver/black DIN/ASA scale. 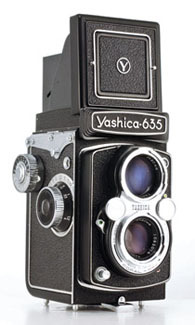 None of the examples have the ® mark used on export cameras even though the focusing scale is in feet (as for all 635s) and the ® mark was introduced at the end of 1956 with the first of the Yashica As and Cs. In this first group are cameras with current owners from the UK and USA but at least six have originated from Japanese auction sites. Perhaps the first batch was for domestic consumption and some have ended up overseas through Service personnel/channels etc? The next two cameras have new seven digit numbers 5850xxx (1958, May) and taking and viewing lens numbers in the 229xxx to 231xxx range. They are the first with the ® mark. This is followed by 5860xxx with taking and viewing lens numbers in the 405xxx range. It is the last in the database to have “Made in Japan” in the accessory shoe. The following cameras have a random mix of lenses beginning with “2” or “4” before moving on to “5”. Camera 5870xxx has taking lens number 238xxx and 410xxx viewing lens. Then there are two cameras in a new numbering range with seven digit numbers 3890xxx which I believe translates to 1958, September. The next four cameras have eight digit numbers 38100xxx to 38102xxx and taking lens numbers between 253xxx and 450xxx with viewing lenses between 251xxx and 444xxx, all from October. The next camera has taking lens number 258xxx. Then start a block of cameras with seven digit body numbers commencing with 3910xxx and ending with 3930xxx, January to March 1959. 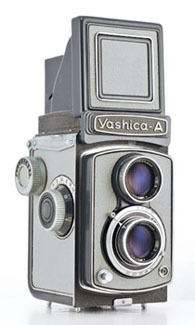 Until the last one, all the cameras so far have the “Yashica” oval between the lenses, black leatherette insert ring in the control wheels and the early hood emblem. 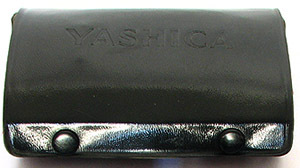 With the last of the group, 3930xxx (lens 488xxx), the “Yashica” oval between the lenses changed to block letters. 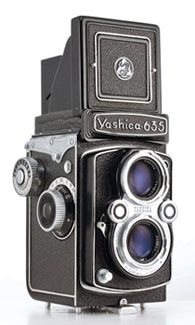 This is also the only Yashica 635 example with the black radial style control wheels, subsequent cameras have the black ring insert again until the matte silver type. There is one more camera, 3931xxx which momentarily returns to the “Yashica” oval before the block letter style is contiguous. Next is a block of cameras with serial numbers from 4110xxx to 4121xxx and taking lens numbers from 544xxx to 559xxx, all with the earlier control wheels. Then there is a block of six digit 1960 serial numbers. 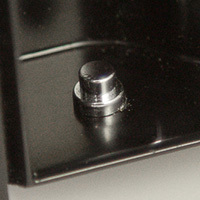 The first, 620xxx (February) is the first with dual scale focusing knob. The next, 630xxx, is the first with the narrow “Y” hood logo on a blue background. Camera 670xxx is the last example with leatherette insert in the control wheels. The next camera is the first with the dull silver control wheels. This has the only 9 digit 635 serial number, 136110xxx, with taking lens 657xxx and viewing lens 658xxx. As discussed on the Serial Numbers page, the “13” is likely to indicate the 635 model, “6” for 1960, “11” for November and the last four digits, the number made so far that month. This is followed by the first prefixed body serial number, ST 1010xxx, from January 1961 according to my date code theory. The two screws in the back disappeared by ST 2101xxx. ST 3121xxx is the first with tabbed plastic lens caps instead of the hinged metal type and ST 4050xxx was the last with ST prefix followed by the first with SX prefix, SX 4080xxx. However, camera ST 6120xxx has turned up with a very clear number and breaks the neat sequence. By hood logo (narrow “Y” on blue background), it belongs in the ST series rather than in the “61” numbers of the SX series. Also, the two screws near the exposure window, the yellow metre scale on the dual scale focusing knob and the two screws in the back (all of which disappeared during 1962) and 665xxx and 666xxx lens numbers date the rest of this camera to near the start of prefix numbers (1961 instead of 1966). 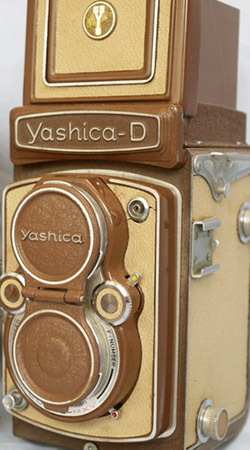 I am as certain as I can be that the nameplate (and serial number) originate from the Yashica spares system. SX 5031xxx is the first with the plainer, second type plastic lens caps. At SX 5070xxx, the control wheels changed to the later, shinier type. Around SX 6021xxx (February 1966), the hood emblem changed to the wide “Y” type. The parallel bars on the rear of the focusing hood changed to black with camera SX 7071xxx, around July 1967. Between cameras SX 7122xxx and SX 8020xxx, the satin black focusing hood blind changed to a textured finish. 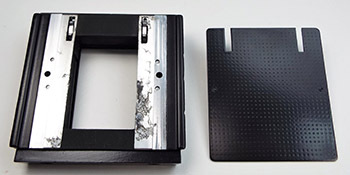 Between cameras SX 8030xxx and SX 8040xxx, the slotted accessory shoe screws changed to a cross head type (probably JIS). The numbers get to SX 9110xxx (lens number 948xxx) and then, as with the Yashica D, start again with SX 0030xxx (presumably March 1970). Two cameras with SX 0080xxx body numbers, the first with taking lens 992xxx and the second with viewing lens 997xxx, are the last the last examples with Yashikor lenses. SX 0081xxx introduces the Yashinon taking lens, number 1017xxx, and the f/2.8 viewing lens without serial number, although some immediately following taking lenses have numbers as low as 98xxxx. All subsequent lenses are of these types. This camera is also the first using the cross head screws for the strap holders. SX 0094xxx is the first with the new style textured nameplate. Its locking knob is still chrome. There are three other cameras with SX 0094xxx serial numbers; on the first, the knob is not visible but the second is the first example with the black plastic Yashica Mat-124G locking knob. The third reverts to chrome but the following cameras have black knobs. These cameras are all from September 1970. Camera SX 0101xxx from October has the other new features but reverts to a plain nameplate so there was a slightly messy changeover period but only over a month or so. A single December camera also has a chrome locking knob but it may have been changed later or Yashica found an extra one sitting around. Camera SX 1072xxx has the highest taking lens number 1071xxx but the last two cameras, both SX 1081xxx (August 1971), have taking lens numbers 782xxx and 778xxx respectively. These lower numbers seem to belong to another range shared with the late Hong Kong assembled Yashica Ds. 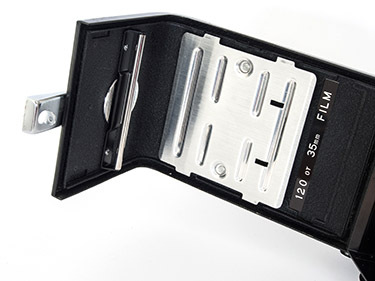 A unique kit case, called “compartment case” by Yashica, was also available for this model to hold both the camera and the the 35 mm kit. All the earlier ones that I have seen are marked “Yashica 635” and later ones simply “Yashica”. No mention of “Yashicaflex”. This may be part of the answer. It featured in the first three of the four user manuals at the top of this section rather than the usual instructions on how to remove the ever-ready case and is mentioned in several ads and brochures as being included in the price. 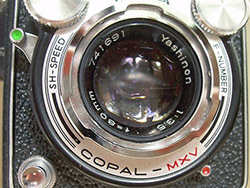 In the last manual featuring Yashinon lenses (1970), the compartment case is not mentioned and the instructions revert to the removal of the ever-ready case. It is possible that the earlier ever-ready cases, were only supplied as optional extras. So far, I have not seen a 635 for sale with both ever-ready and compartment cases, only one or the other. 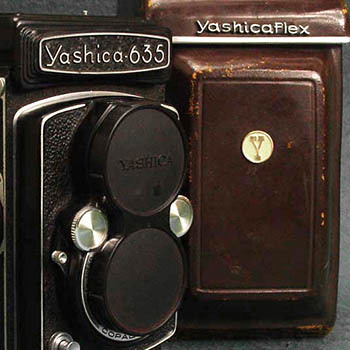 But it still doesn't explain Yashica's thinking behind “Yashicaflex”. The earliest examples have the stylised “Y” focusing hood logo on black leatherette (see also below), just under half have the narrow “Y” on gold background on either black or grey leatherette (image immediately below) and the rest, the most recent examples, have the narrow “Y” on blue background. 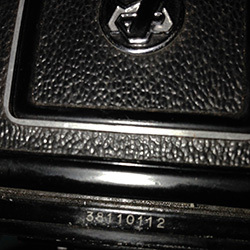 Cameras with 1961 serial numbers (“B” prefix) are only found with black leatherette. There were no coloured 66 cameras of any model after December 1960. 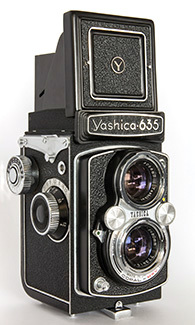 This model also has an almost exact Yashicaflex clone, the Yashicaflex A (new model) which was released a year earlier. 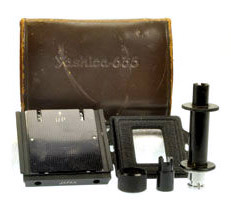 The Yashica B has Yashikor lenses with plain filter mounts and the basic Copal shutter from the Yashica A without slow speeds, all mounted in a lens panel type normally found on Bay 1 type cameras. Apart from trim, it is a Yashikor lensed Yashica A with self-timer, auto-stop winding and a fresnel viewing screen added. In other words, it fits between the entry level Yashica A and enthusiast D in both price and specifications (production of the Yashica C ceased at around the time of the release of the models B and D). All have trim details and serial number patterns consistent with the early Yashica D and therefore it was probably released at or very near the same time. It came in light grey leatherette and black metalwork as well as all black. It appears to have arrived in black and ended in black but like the Yashica Auto, both grey and black versions seem to have been available concurrently. It is found with both meter and feet focusing scales and both are found with the ® mark suggesting an export only model. 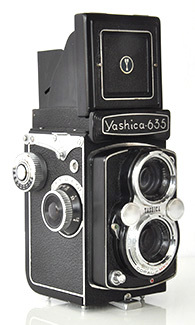 Japan had the equivalent Yashicaflex A (new model). However, this is an uncommon camera. The only ads or brochures that I have seen it in are two 1959 ads by the Singaporean importer (Singapore Free Press 8 July and 27 Oct) and a 1961 Swedish brochure. It seems to turn up more often in Europe than anywhere else and I suspect that was the target market. Correspondent Sumanta Chandra has since sent me details of his camera, featured at the top. It has earlier serial number 38100079 and taking lens 253807 and viewing lens 446119 but in other respects, it is the same as Sandra's example. The third (38110xxx) and fourth cameras (38120xxx, December 1958) are still the same and all have feet focusing scales. The fifth camera has new 7 digit body number 3920xxx (February 1959) and lenses 279xxx and 481xxx. It is the first example with grey leatherette and the first with the narrow “Y” hood logo on a gold background. The sixth and seventh cameras with serial numbers 393xxxx (taking lens 491xxx) and 3930xxx are again all black and are the last with the oval logo between the lens. 393xxxx is the first with the focusing knob scale is in metres after which they appear in roughly equal numbers until dual scale knobs. The next camera, 3940xxx, has grey leatherette and the “Yashica” between the lenses is in block letters as on all following cameras. The focusing scale in feet. The following camera, is the same. Then there is black camera 394xxxx followed by grey 3941xxx, both with the focus scale in metres. Then there are four all black cameras again, all starting with 3950xxx and with taking lens numbers 299xxx, 500xxx, 300xxx and 503xxx respectively. The focusing scale on the first is unknown but the second is in feet and the third and fourth are in metres. The second of the group is the first with narrow “Y” hood logo on a blue background but the third camera has gold again and on the last, the logo is missing. The next camera, grey, begins a new 6 digit series with number 620xxx and new taking lens series 575xxx, and now the narrow “Y” hood logo on blue background appears consistently on both black and grey examples. The following example, also 620xxx, is the same and both have focusing scales in feet. The subsequent cameras all have dual scale focusing. As well as these two, the next four examples are grey the last of which is 640xxx with taking lens 601xxx. This is followed by the last in the series, 660xxx, which is black as are the rest of the examples. The “B” serial number prefix was introduced with B 1030xxx followed by B 1060xxx and B 1080xxx. The last two examples both have serial numbers B 1120xxx with taking lens numbers 782xxx and 794xxx. This particular example belongs between the first grey cameras (not shown) and the first brown cameras. 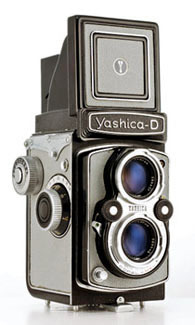 According to Karl Kahlau's Yashica/Kyocera documentation, the Yashica D was released a few months after the Yashica 635. He doesn't have an end date but according to the website “A Partial History of Yashica TLRs”, using similar source material, it lasted until 1972 or 1973. By serial numbers, I have found evidence of production up to 1971 so far to which Hong Kong production has to be added (see below), making 1972 feasible. 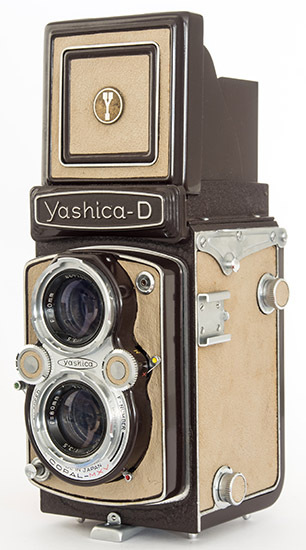 As already noted, this is a rebadged Yashicaflex B (new model). Apart from trim, it is the same as the Yashica 635 less the ability to use 35 mm film. It has the Rollei type control wheels, Copal MXV shutter and for most of its life, Yashikor lenses. The model history parallels the Mat and 635 with the Yashica A thrown in for colour. Over time, Yashima had used and re-used the letters “A”, “B” and “C” to mean various things and I think that by this point, “D” was simply the next available letter in the alphabet. It certainly did not develop from the Yashica C, not directly anyway. 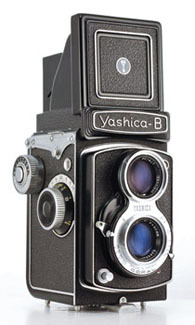 Early examples with metre focusing scales and also internal light baffles (see further down) are not uncommon and seem to be a direct domestic market replacement for the Yashicaflex B (new model) which seems to have ended production when the Yashica D was released. In fact, unlike the export version, the early domestic Yashica D and Yashicaflex B (new model) were identical except for colour, nameplate and the combined DIN/ASA scale on the D.
The early cameras up to 38121xxx (December 1958) have only been found with metric scales. All the colours appear in this period except for grey leatherette/black metalwork. After that example, most cameras have feet scales and most cameras have grey leatherette/black metalwork. The rest are grey/grey (except for four black examples). Most of the grey/grey examples seem to be Japanese market versions (see below). The folding metal lens caps from this period matched the metalwork colour as it seems that the square metal lens hoods did. 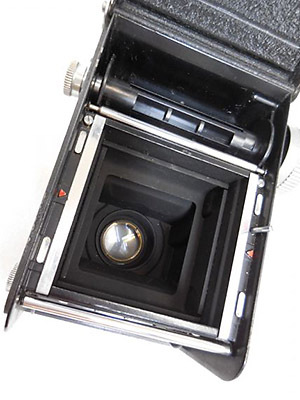 There is a photo of black, grey and brown lens hoods together on a Japanese site and I have seen a grey one for sale with a matching Yashica D.
This is the same example as at the top. Correspondent Dillon Ang kindly sent me details of his camera. It came in a grey case which is probably original and the only colour produced during the time of coloured cameras. The only example with the 9 flag film speed reminder on the film winding knob so far is the example in the early user manual. All others I have found have the later silver/black DIN/ASA scale. The two earliest Yashica Ds in my database, both with serial numbers 38110xxx which I presume is from November 1958, and the fourth earliest with a similar serial number owned by contributor Sandu Baciu are grey examples with the same internal light baffles as the Yashicaflex AS (new model). I have clear photos from Japanese sites of another two early examples (serial numbers not visible) with brown metalwork and baffles and Sandu has a similar example with body serial number 3812xxxx and taking lens serial number 462xxx. The camera below left is number 38123194 owned by Tom Heckhaus (also featured above). Grey camera 3940xxx from April 1959 has the same trim and features. However, seven later grey cameras, three with serial numbers in the 3950xxx range (one owned by contributor Leigh Harris), the camera below right with November 1959 number 410xxxx and three with 1960 serial numbers 610xxx to 620xxx (another of which is also owned by Leigh Harris), have the more abbreviated baffles that reappeared on the Yashica Mat-124G 10 years later. All have metre focusing scales and therefore were almost certainly intended for the domestic Japanese market (most in my database have originated from Japanese auction sites). See also “Japanese Market Yashica Ds” a little further below. There are at least eight more examples with the small baffles. Like the rest, these are now black cameras with dual scale focusing knobs and look the same as export models except for the 4 screw accessory shoe. The first has late 1960s taking lens serial number 600xxx. 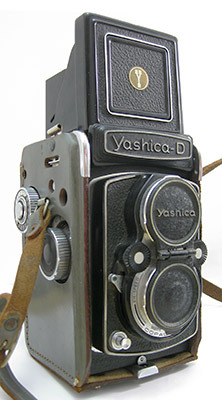 The next is the first Yashica D with the dull silver control wheels (lens numbers 600xxx and 603xxx). Nine digit serial number camera 126110xxx (lenses 656xxx and 655xxx) reverts to black leatherette rings in the control wheels. The following camera is back to the dull silver control wheels (lenses 673xxx and 6667xxx). 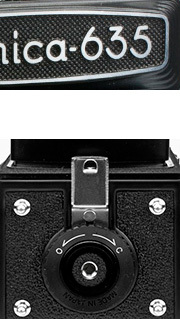 The next camera is definitely from 1961 and the serial number might be D 1080xxx with both lenses in the 751xxx range. D 1110xxx follows. The second last camera with baffles has lens serial numbers 944xxx which places it right next to the last camera with serial number D 2110xxx with taking lens 945xxx, probably from November 1962. Unfortunately most cameras don't have the insides visible. There are more examples with the Japanese market accessory shoe (see below) in my database but by the early 1960s, they are becoming quite rare and the last is camera D 4090xxx (from September 1964) before the 4 screw type is universally adopted in 1967 - unfortunately the inside of the camera is not shown. See “Internal Light Baffles” for more detail. By the time that the Yashica D arrived, accessory shoes were secured with four screws. 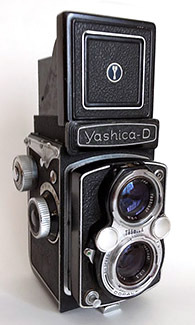 The first Yashica Ds in my database have metre scale focusing and presumably were intended for the Japanese market. 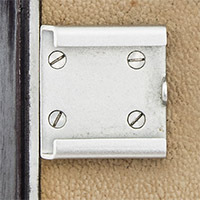 In fact, there are another two screws in the front under a cover plate. There is also a flat spring in each groove to positively grip the flash, or other accessory. The shoe reverted to the simpler four screw style in 1967 (camera D 7090xxx). 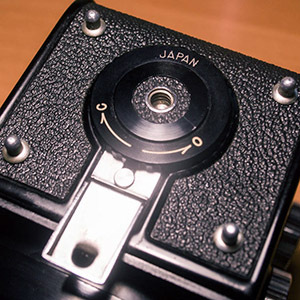 On late cameras, starting July 1968 or a little later, the slotted accessory shoe screws were replaced with cross head types (almost certainly Japanese JIS standard rather than Phillips - tight screws can be damaged by a Phillips driver). Note, the strap holder screws also changed but not until about April or May 1970. For the period that the extruded shoe was in use, my database also includes seemingly random three screw types. It seems that these either have the cover plate missing or have had the shoe replaced with an earlier type which probably use the same holes. Nevertheless, there are at least ten such cameras. 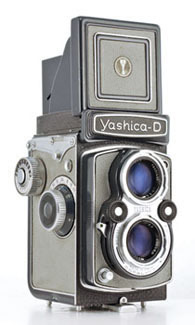 As noted above, Japanese market Yashica Ds continued with the four screw type and were either not fitted with the extruded shoe at all, or received it much later. The last confirmed Japanese market type Yashica D in my database is camera D 4090xxx from September 1964. This still has the four screws. Coloured cameras with metre focusing scales seem to have three other things in common; internal light baffles, four screws in the accessory shoe when contemporary cameras use the extruded type with cover plate and they continue to use the leatherette rings in the control wheels after the introduction of the black radial type (both were replaced by the dull chrome type very shortly after the cameras reverted to all-black). It seems that all these features appeared together in the Japanese market version - there are examples where not all the features are visible but there are no contradictions. Also, the coloured cameras are unlikely to have black metalwork. Grey/grey was the most common but the earliest cameras were just as likely to have brown metalwork. 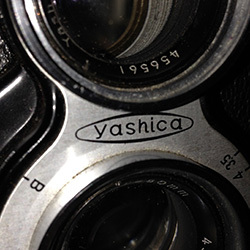 One other common feature is that earlier Japanese market cameras also continued with “Yashica” in the oval between the lenses after export cameras adopted block lettering in February 1959, but only until May 1959 when the Japanese version changed as well. As noted in “Baffles” and “Accessory Shoes” above, there are also some early 1960's all black cameras, the last from 1964, with 4 screws in the accessory shoe. These now have dual focusing scales and apart from the accessory shoe, the only other difference to the export models are the internal light baffles (not visible on the 1964 example). 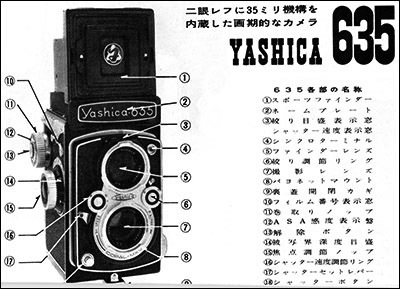 There is a 1959 Japanese brochure (it includes the Yashica A III and short production run Yashica Auto) with a Yashica D without hood logo on the back cover. None without logos have been found in the wild and I suspect its a pre-production example but you never know. Incidentally, the Yashica D was released in November 1958 and as alluded to earlier, it seems from my database that all November and December production went to Japan. The four early black cameras mentioned above, with serial numbers 3910xxx to 3920xxx, have focusing scales in metres from the period just before cameras with feet scales swamped production. 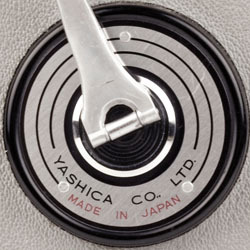 In common with the Japanese market cameras, they have the leatherette inserts in the control wheels, “Yashica” in the oval between the lenses and accessory shoes with four screws. The only item that they are missing are internal light baffles (two out of four, other two interiors are not visible). Three of the four have a European history (the fourth is unknown) and three of the four have the ® mark which is not evident on Japanese market cameras (top of nameplate is not visible on one of the cameras). As a point of difference, Yashica-Mats sourced from Europe do appear to retain their baffles for the relevant period. These may have been lower volume without a specific export type or may simply have been subject to a different marketing strategy. In Shutters, I note that in 1958, Yashica began to introduce the “modern” shutter speed range of 1, 1/2, 1/4, 1/8, 1/15, 1/30, 1/60, 1/125, 1/250 and 1/500 to replace the “old” range of 1, 1/2, 1/5, 1/10, 1/25, 1/50, 1/100, 1/250 and 1/500. Several correspondents have mentioned that their 1960 and beginning of 1961 Yashica Ds still have the old speeds. 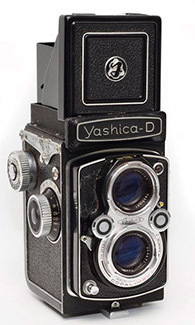 All the coloured cameras seem to be in a block, similar to the Yashica A pattern, at the beginning of the narrow “Y” hood logo with almost no all-black cameras except three in this period. 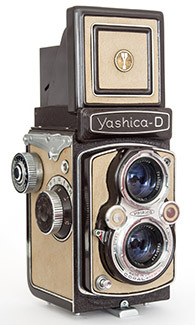 Out of 239 Yashica Ds in my database, 57 are coloured (therefore, 60 of the 188 cameras are from 1960 or earlier). There are 29 grey/black, 19 grey/grey (rare), 5 warm grey/dark brown (very rare), 1 cream/Golden Brown (extremely rare) and 3 with grey leatherette but unknown metal colour. The first camera, serial number 38110xxx with taking lens 452, has grey leatherette and grey metalwork, grey inserts in the control wheels and the narrow “Y” hood logo on a gold background. The second camera also has taking lens 452xxx. It is interesting because it has a matching grey lens hood. The next camera is still 38110xxx, some 500 cameras after the first and with the same trim still. The fourth camera is the Golden Brown example with taking lens 453xxx and viewing lens 259xxx. This is followed by 38111xxx with warm grey leatherette and brown metalwork with taking lens 454xxx and viewing lens 259xxx.Up to serial number 38121xxx is a mix of warm grey and brown and all grey examples. The next next three cameras have 7 digit numbers 3910xxx (taking lens number 269xxx) to 3920xxx (taking lens number 276xxx). They are the first of a 30 camera block extending to 3990xxx. They are the first of only four black cameras in the colour period and as noted above, I believe were intended for the European market. After these black examples, all following export cameras have the name in block letters. With the coloured cameras up to this point, the leatherette ring inserts of the control wheels have matched the camera coverings. The following cameras continue with 7 digit numbers and are mainly grey/black with the odd grey/grey thrown in. Camera 3921xxx is the first example with the focusing scale in feet. From now until dual scales, focusing scales in feet predominate. The cameras usually have black radial control wheels, the first four, up to 3922xxx (all grey/black) have red centres with white rings, the ones after that have white centres. Two grey/grey cameras, 3931xxx and 3932xxx, have the black radial wheels with white centres but the other grey/grey examples have the grey leatherette rings in their wheels as well as focusing scales in metres and also accessory shoes with four screws - almost certainly Japanese market cameras. The last in this series is 3990xxx, the third of the black cameras and the only black example with the gold hood logo. Then there is a new series of numbers starting with 4100xxx. Between camera 4101xxx, with lens number 536xxx, and 4102xxx, the gold focusing hood logo background changed to the blue background. There are a number of cameras with 4102xxx numbers and these are the last in the series. The next block has 6 digits. The first is 610xxx (lens 564xxx) followed by a camera with taking lens 565xxx and camera 611xxx (lens 567xxx). At 621xxx, the focusing knob changes to dual scale (before this, there has been a mix of feet and metre scales with feet being a slight majority and predominant towards the end and meters being exclusive in the beginning). 631xxx is the last coloured camera. The next camera, 641xxx (lens 598xxx), is black and is the last camera in this series. Probably. D 1020xxx, taking lens number 680xxx, is the first in the new series and also introduces the new plain mat silver control wheels. D 1051xxx is next with taking lens number 709xxx and viewing lens 708xxx. The Yashica D lost the two external pressure plate screws on the back between D 2080xxx and D 2110xxx. Between cameras D 3010xxx and D 3040xxx, lens serial numbers got to 998xxx at which point they seemed to start again with 149xxx. At around D 4041xxx, the lens caps changed from hinged alloy to the first plastic type with tab. At around D 5110xxx, the control wheels changed to the shinier reflective type and the plastic lens cap changed to the 2nd type plastic without tab. My January 1966 camera D 6010254 (taking lens 400282 and viewing lens 401134) is the first with the wide “Y” hood emblem. At around D 7072xxx, the parallel bars on the hood changed to black. Between cameras D 8020xxx and D 8040xxx, the satin black focusing hood blind changed to a textured finish. Between cameras D 8070xxx and D 8100xxx, the slotted accessory shoe screws changed to a cross head type (probably JIS). The numbers run up to D 9121xxx (taking lens 949xxx and viewing lens 947xxx) which I believe is December 1969. Between camera D 0040xxx and D 0060xxx (April and June 1970) the strap holder screws also changed from slotted type to cross head type. Before these two is camera D 0030xxx (March 1970) with a Yashikor viewing lens and Yashinon taking lens. Even though it is near the end of the Yashikor period, I doubt very much that the Yashinon is original. D 0061xxx still has both Yashikors with taking lens number 998xxx and the next two taking lenses, 1000xxx and 1001xxx are also still Yashikors. I had assumed that the Hong Kong cameras came after the last of the Japanese production but maybe they were concurrent or maybe Yashica stopped identifying the Hong Kong production. Who knows where this camera was made? 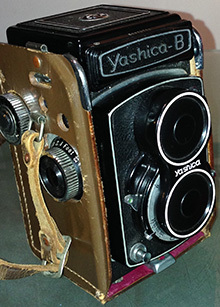 Other models with black locking knobs continued with “Made in Japan” including all examples of the Yashica Mat-124G that I have seen. There are 40 examples in my database (including the Hong Kong ones below) with the Yashinon lenses - about 1 in 5 of Yashica D examples which is significantly higher than Yashica 635 examples and also Yashica-Mats with f/2.8 viewing lenses. 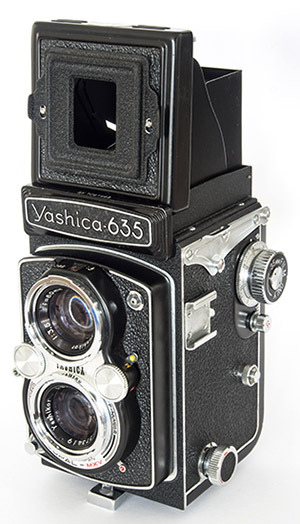 There is a group of fifteen cameras in my database with late features including cross head screws for both accessory shoe and strap holders, textured nameplate, Yashinon taking lenses and unnumbered Yashinon f/2.8 viewing lenses, just like the previous examples. However, they, or at least some of them, are clearly made, or assembled, in Hong Kong. Unlike the previous Yashica D examples, the serial numbers are six digit and appear to be consecutive without any date code. All are prefixed with an “H”. There are references on the web, including by the Yashica Guy, to 35mm cameras being assembled in Hong Kong but I have found nothing about TLRs. The 35mm cameras also have the H prefix. I have seen no evidence of other Yashica TLR models being assembled there. This example is the last one in my database, i.e. with the highest serial number. At face value, these three appear to be made in Japan but retain the Hong Kong numbering. It is possible that Yashica decided to be cute about whether “assembled” meant “made” or not but there is no way to know what was really going on. The found camera serial numbers in my database run from H 101xxx to H 113xxx and the Yashinons appear to have their own serial number range from 724xxx to 795xxx but one camera in the middle of the group, H105xxx, has a lens number that seems to belong to a “normal” 1971 Yashica D, 1036xxx. This camera is odd in other ways - the focusing hood has been replaced with a 635 type (it has the pins for the 35 mm sports finder mask) and the taking lens has “Made in Japan” under it, the only found example with the “Hong Kong” locking knob. Perhaps it has undergone more extensive repairs. Note: Most/all Japanese brochures and the user manual, linked above, show the camera with a hood logo. Either the photos are of an export Yashica A (there is plenty of evidence of Yashica cutting costs by using existing images), or the deletion of the hood logo was a last minute decision. The fact that the camera has no hood logo and serial numbers match is a clear indicator that the variant without hood logo is the A III. My database has twenty five of these coloured Yashica A based cameras. The first camera in the database has grey metalwork with grey leatherette. The next two have brown metalwork with warm grey leatherette. The rest have grey leatherette; the earliest one with black metalwork, the others with grey metalwork. Whilst most early Yashica As have feet scales (those with metre focusing scales had the 10 flag DIN film speed reminder and were certainly Europe bound), all of the Yashica A III types have a metre focusing scale whilst the last four in my database have dual scale focusing knobs. All seem to have the later combined DIN/ASA film speed reminder on the film winding knob. Given the feet scales of most early Yashica As, my thinking is that the almost identical Rookie (except for its 6 x 4.5 capability) initially fulfilled the Yashica A's role domestically followed in 1958 by the similarly specified, but with shutter cover plate, Yashicaflex A (new model) which was also marketed in Japan as the “Yashica A” and that the Yashica A III was released later to offer the option of different colours. It was called “A III” because “A” had already been used. The majority of the cameras in my database have originated from Japanese websites and typically for Japanese market cameras, there is no ® mark on top of the nameplate found on export cameras from the same period nor “Made in Japan” or “Japan” in the accessory shoe, as found on the corresponding Yashica A examples (note that as well as the hood logo, the user manual shows “Made in Japan” in the accessory shoe suggesting that the photo is of an actual Yashica A). Camera cases and boxes are identical for both models including the English text on the box. This far, body numbers have the following patterns; seven digit numbers 3933xxx to 3962 (1959 March to June), eight digit 39100xxx (1959 October), seven digit 4110xxx to 4120xxx (1959 November and December) and six digit numbers 611xxx to 680xxx (1960 January to August). 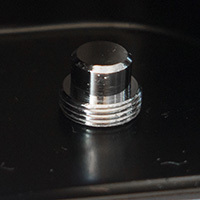 Dual scale focusing knobs were introduced between 611xxx and 661xxx. Available in both grey and black, both Sugiyama and McKeown agree on a 1959 introduction as opposed to 1957 for the Mat. From trim details, this is about correct because the camera has features that didn't appear until later in the Mat (and Yashica D). 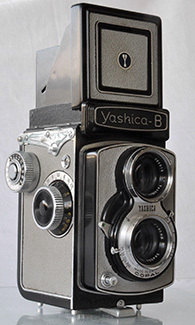 These include the later locking lever, the narrow “Y” hood emblem, the “Yashica” name is in block letters between the lenses and the control wheels are black radial, just like the Yashica-Mat LM released in late 1959 or early 1960. The name on the circular cover plate under the crank and also on the boxes is “Yashica Co., Ltd.” like the later Mats whereas the early Mats had “Yashima Opt. Ind. Co., Ltd.” and before that, the examples with Lumaxar 75 mm lenses had no writing under the crank. This is a rare short lived camera, possibly produced over only a few months, according to my serial number date code theory, from March 1959 to May 1959. It was a cheaper version of the Mat most probably released for mainly the domestic market - all of the examples found have metre scale focusing knobs. This would fit with Sugiyama’s common rating. There is one Japanese ad of the Yashica Auto together with a Yashica A III and they also appear together in a Japanese brochure. I have found no evidence of any advertising of the model elsewhere in the world. Nevertheless, there is an English version of the user manual (B&W scan available from OrphanCameras.com with a full “colour” but lower resolution version available from this site). In keeping with its budget status, the manual or “Directions for Use” is a more basic fold-out sheet rather than the booklet form for contemporary models and misses out on the aperture, shutter speed and exposure information normally provided. I haven't seen a Japanese version. Also, the two very earliest examples of the Auto have the ® mark which is not usually found on Japanese domestic market cameras (more here). It is possible that some were intended for export markets. A few of the cameras in my database have turned up from outside of Japan and contributor Tom Heckhaus has one of these, but, most have been found on Japanese auction sites (at one stage a number of them appeared for sale by an Australian seller but I suspect these were recent imports). I say cheaper than the Mat because of both the lenses and advertised price. Barry Toogood has a Yashica Auto with Yashikor lenses, whether these are original, perhaps an early version, I don't know but I very much doubt it, especially as the model was not made for very long. The lenses in the user manual are “Yashinon” as they are on thirty six others where I can read the lens name. However, these “Yashinons” are all likely to be triplets, just like Barry's Yashikors. All other Yashinons on 6x6 cameras (except the automatic exposure Yashica E, presumably designed for the novice and hence also lower spec'd) have either f/3.2 viewing lenses or f/2.8 by the early 70s. Clearly, the f/3.5 Yashinon viewing lens on the Auto is a budget alternative. “Yashinon” is a brand name, not a formula like “Tessar”. 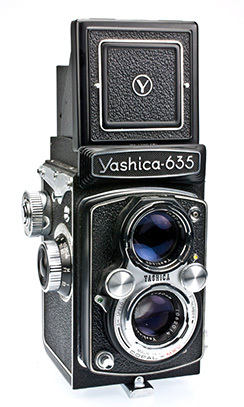 As mentioned in “Lenses & Shutters”, the Japanese site TLR66.com seems (as translated by Google) to suggest that the lens sets on both the Yashica Auto and Yashica E are rebadged triplets. Japanese Wikipedia seems to repeat the claim regarding the Yashica Auto. Tests appear to confirm that. Also, a 1959 Japanese brochure confirms that Yashica 44LM Yashinons are 3 element so the precedent is clearly established. A 1958 Japanese brochure lists the the Yashica-Mat at 21,500 yen and a 1959 Japanese brochure lists the Yashica Auto at 15,000 yen (the Yashica 44 prices didn't change from the first brochure to the second and the Yashicaflex B price in the earlier brochure is the same as the Yashica D, its replacement, in the later brochure). To me, that confirms the budget specs and that Yashica had no long term aspirations for this model - it would hurt both Mat and probably the D sales (listed at 11,000 yen) as well. If miracles happen and it had Tessar formula lenses, it would be a Yashica-Mat with a new nameplate and 33⅓% price drop (OK, the viewing lens would be lower spec but hardly justifying that drop) and who would buy a D if for only a little more, you could upgrade to Tessars and crank wind? The only definite variable during its production run was the availability of black or grey leatherette. There are thirty seven cameras in my database from 3930xxx to 3950xxx with lens numbers from 200xxx to 212xxx. The pattern from first to last is 4 grey cameras, 1 black, 23 grey, 8 black and 1 grey. In grey, a pretty camera now sought after because of its rarity in the West. In black, rarer still. In other words, very collectible but not one for the user.